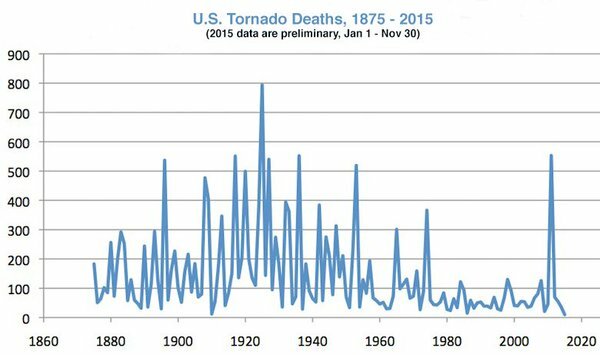 In the 'warmest year ever', U.S. tornado deaths were near lowest ever | Watts Up With That? While pundits such as AP’s Seth Borenstein are trying to link some climate and weather connections in a new study, this sobering fact is worth noting. Since record keeping began in 1875, U.S Tornado deaths are near the lowest ever for 2015. And, this is the fourth year in a row that tornado deaths have been below average. Paul Homewood notes a downward trend in all tornado types, weak and strong. It’d be great if just one journalist (any!) would note that 2015-warmest year ever- also had the lowest catastrophe losses in a generation. March 17, 2016 in tornadoes. Is an increase in tornado activity in the US specifically forecast by the IPCC as a likely outcome of continued warming? I can’t find anywhere in the IPCC summaries that says it is. Not sure why the IPCC would be expected to make a statement on small-scale regional events. Tornadoes are too small to show up individually in climate models. Maybe the tornados are hiding in the oceans with all the missing warmth? Well not any more; now that we know that climate is weather, and it all is Fractal, so everything occurs the same at every possible scale. They did quite well (it was published in 2008), but there’s no mention of any expected increase in tornadoes. No, an increase in tornado activity isn’t forecast in the AR5 for anywhere. Just an increase in severe weather incidents, like tornados and hurricanes which are not happening. That’s disingenuous. CAGW supporters, promoters and the media routinely report tornadoes as extreme weather events. When ever a tornado demolishes a town, regardless of the strength of the tornado, it is trumpeted as an indication of global warming. When your church won’t tell you the truth about your religion, you know you’ve been had. An increase in extreme weather was predicted in the first few IPCC reports, until someone finally realized that they had actual data they could look. (that has existed since 1950 or so) that showed quite clearly the predictions were completely wrong. They took it out of the most recent report. 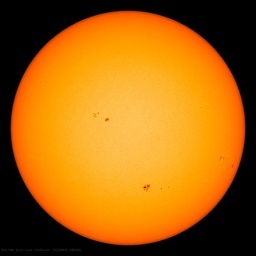 The stupidity of the situation is that so called scientists took so long to realize that evidence disproving the prediction had existed the whole time, and it had been pointed out by skeptics the whole time, but the climate scientists simply ignored the existence of the data. Does that sound familiar? There’s still an increase in extreme weather events predicted. There’s more water in the atmosphere so rainfall and flooding will (and have been observed to) increase. There’s a more and bigger hadley cells (which are pretty well modelled in the northern hemisphere, but the southern hemisphere still has the double ITCZ problem), so increased rainfall in the tropics, with longer and more intense droughts in the mid latitudes is expected (and observed). events over land has increased in more regions than it has decreased. It doesn’t say anything about tornadoes though. Observations of tornadoes is that there is a statistically significant increase in the number of tornadoes per cluster, but the reason why is not known. NOAA started trying to model tornadoes a couple of years ago. Watch that space. The problem with making definitive statements about trends is that typically we have poor records/data for the early years (anything before comprehensive satellite observations) and we don’t know the length of natural cycles (or even if they exist with respect to extreme events). That said, US records for major tornadoes are probably fairly accurate, especially if you start sometime after WWII. Given that GHG-induced warming is small on an annual basis and gradual (as well as oscillating) on a decadal basis it is reasonable to require decades of data to confirm whether model projections are accurate. For example, the cited article on “clustering” of tornadoes notes there has not been an increase in the number of tornadoes since 1954. That would actually be a sufficient period to test some projections of climate models/theory but you run into the problem that major emissions of GHGs started near the beginning of that period. Therefore, detection of climate change due to GHG forcing may only be detectable in the later decades, if at all. In other words, to filter out natural variability we may have to wait a few more decades, at least on the question of extreme weather events. There’s still an increase in extreme weather events predicted. Gotta keep the grants flowing! There’s more water in the atmosphere so rainfall and flooding will (and have been observed to) increase. Nope, wrong again. I’m under the impression that tornadoes require cold air; not hot air. Well they need hot air as well, but it is the absence of cold air swooping down from the north that leads to a dearth of tornadoes. Well I read that somewhere. It is NOT the fruits of independent personal research. I do remember though, not so long ago, a sudden cold snap through Idaho and environs lead to an infestation of severe tornado activity in nearby regions. Some folks I know in Cour d’Alene remember that well. Yeah places like Texas, Oklahoma etc, always have the warm air, which likely is where the energy resides, but it takes a collision with a mass of cold air coming down from Canada, or sometimes Alaska to set the whole thing buzzing with tornado activity. In the Midwest, the cold crap comes down through Wisconsin which is where the Great Lakes are . Not surprisingly the last discomfort is known as “The Wisconsin Glaciation”, and it made the Great Lakes. USA is king of the hill tornado wise, and Tampa Florida is first in line in some tables to get tornado clobbering. And I’m sure that it is a consequence of the close proximity of a lot of tropical warm air and moisture coming up from both Pacific and Atlantic through and across Mexico, and Texas, and then those two regions where really cold air masses can come down from the north, through Saskatchewan/Wisconsin in the Midwest, and through Idaho/Montana west of the Rockies. I spent the first 25 years of my life in OKC, and I remember feeling the temperature drop suddenly on many a hot spring afternoon and knowing that the evening was going to get interesting. Note the tornado spikes, one in 1974, one in 2011. Both correspond to when the Polar Vortex descended into the continental US (Hubert Lamb pointed out the descent the 1st time); both preceded the coldest and 2nd coldest winters in US history (by 2-3 years). The insurance industry promotes potential catastrophes in the MSM via a not insignificant advertisement spend. MSM reluctant to bite the hand that feeds it? Absolutely, all of these groups buy news from BBC and CNN and the like, positive coverage is a product the media sells, not only to the IPCC and alarmists but to despot middle east monarchies. Give it a few days, they’re still working out on how they can give Obama credit for fewer tornadoes. I would hate to be killed by a tornado only to become a warmist statistic. Not really. I mean, you’d be dead, so you wouldn’t be around to be annoyed. And I can’t imagine any skeptic would be so uncouth as to be annoyed that your death boosted the warmists’ statistics. On the other hand, I can imagine warmists getting annoyed if a warmist’s death boosted skeptic stats. Some credit must be given to early warning systems. Agreed. But another point to make is that during the period where Doppler RADAR and satellite imagery have enabled the early warning (essentially 1999-present), population density in the main 5 US states comprising “tornado alley” has increased by around 13%. Yet, deaths have a downward trend. In other words, during a recent period where early warning has been available, population climbs while tornado deaths drop. Factors likely include (in no particular order): less frequent tornados (the point of this post), education, media technology (smart phones, internet connection, etc), luck, and others. How do early warning systems affect the number of tornadoes ?? Since no tornado ever happens again, it is impossible to compare deaths without warning, and deaths with pre-warning. But I do know of one tornado, where certain death of an entire family was prevented by a can of sardines; well actually they were herrings. The family was sitting down to dinner just before sundown, in Maryland Heights, in St Louis County Mo. The mother gave a can of herrings to an 8 year old boy (thereabouts) to open the roll top can. With the can half opened, the kid slipped, and slashed right across his whole palm; blood everywhere. Well they went to the St Charles hospital emergency room. While there, this tornado, went whizzing right down the street behind my house tearing up power lines and peeling the corners off some of the houses on that street. The one house at the bottom of that hilly street, got special attention. The tornado landed right on top of that one house, and shredded the whole place into a pile of toothpick sized kindling wood, and piled it all into a solid mass in the basement, of what used to be that house. It was the most completely destructicated house I have ever seen after a Tornado. That family’s dinner was never found, including one missing can of herrings half opened. I ushered my family down into our basement, about the same time as that house was getting pulverized. I had to pick up all the eight foot long red wood toothpicks off my front lawn from somebody’s one time fence posts, the next morning, in order to put my house back ship shape. Made good firewood for the winter. So always keep a can of herrings around if you live in tornado country. Whether it is the warmest year ever is irrelevant to a theory which exists only to support a policy of reductions in fossil fuel emissions. The only thing that matters is whether warming is related to fossil fuel emissions. This empirical relationship has been established as a correlation between cumulative emissions and cumulative warming (i.e. surface temperature). All of AGW is a house of cards that sits on this correlation because this correlation is spurious. Some of the reduction in tornado deaths is due to better warning systems and better public awareness. But the reduction in average severe (EF3-5) tornadoes per year is also a contributing factor because these are the storms that kill large numbers of people. I agree with Dr. Pielke Jr., this good news should be shouted from the rooftops. Instead, crickets. When you warm the higher latitudes, you decrease the temperature contrast with latitude. This decreases the energy for some extreme events……mid latitude cyclones, violent tornadoes and the powerful jet streams that cause them. Not a theory. It’s meteorology 101. In fact, tornadoes usually result not from simple thunderstorms but from strong temperature contrasts, a cool front meets warm Gulf air which is why so many and the worst are in this zone of convergence in the central and southern part of the country. There may be a downward trend in the graphs, but it looks to me like there is a pause in the decline going back to about 1985. Since all these climate change prognostications are after the fact, they are indistinguishable from attributions to the gods Zeus and Thor. Climate Science is starting to resemble Etruscan interpretations of thunder and lightning. Could this mean that increase in the TSI during last solar Grand Maximum caused rise in the coral bleaching which was attributed to AGW? Perhaps this explains the Global Warming/Climate Change mindset. Correct! Cyclones – large and small are heat engines. If the temperature difference is small, you have less energy to create them, so they have to be fewer or smaller. Because the tropics have been basically steady while most of the measured warming has been in the colder northern latitudes, the delta-T has generally been shrinking over the past 40 years (individual years vary). This warming has made life better, not more dangerous. Start worrying when the poles start getting colder – the storms will get worse and more frequent. You guys in the states are lucky. Inasmuch as you have tornado and hurricane stats which are a representation of the actions of nature alone. Unfortunately, for residents of the UK and Australia, our primary obsessions are floods and wild-fires, respectively. Sadly, since we have a very powerful lobby of ideologically driven green fanatics presiding over all matters of the environment, in both countries, it has been possible for the greens to actively work towards the creation of the disasters which they predict. The obstruction of drainage and dredging projects in the UK and the intervention against sensible forest management and fire-break clearance in Australia. How it is possible that we let Arts educated buffoon sit on panels and forcefully reject the reasoning and experience of civil engineers and farmers, is beyond me. But that’s what we have been doing for 20 years. And so, the British are now thoroughly indoctrinated into believing that “climate change” is clearly evidenced by the shocking floods in Somerset in 2014. The floods required 20 years of concerted intervention by the green eco-fascists. And now they have the emblematic climate disaster which they so craved. indefatigable….No different than the US really except it has taken 50 years of incompetent policy and marshaling all the fire fighting agencies: US Forest Service; Bureau of Land Management; Fish and Wildlife Service under the Department of Homeland Security to make the wildfire business fly. An EXTREME lack of tornadoes? Just what Global Warming predicted…. …yes, in footnote 312, of Appendix XLII, which although it contradicts footnote 689 of Appendix CCCXI which predicts a probable 93.00005% increase in tornadoes (with a +/- 25% error bar), nobody has noticed yet, so its DEFINITELY settled science. Well, when the story closer to home is “inconveniently boring normal”, yellow journalists like Seth Borentein, Joe Romm, et al., just go somewhere else in world to hype Climate Alarmism to write their drivel. Guys like Borenstein and Romm are today’s best example of Yellow Journalism writers. Do you have evidence to support your claim that drought is not a factor? You are Asking to prove a negative. Typical illogic tactic employed by the idiotocracy against a naive public. That does not work here. Can you provide evidence that little green men from outer space are not a factor? See how stupid your question is? How do tornadoes usually behave in an El Nino year? Looks like they were about average in 1998. It is never that simple when dealing with complex chaotic systems. Sure the ENSO may be a major factor, but there are also others like the AMO phase, the absence or presence of a NE Pacific warm blob and/or R3 high pressure setup, and on and on. What the tornado stats reveal is that there has been some warming that took place that relaxed the latitudinal temperature gradients between the start and end times of the sampling. This is to be expected, opposite of what those pushing climate hysteria like Seth Borenstein, those in government and academia are doing. They need scary and fake scenarios about extreme weather to whip the ignorant part of public discourse into following their twaddle and believing we can control the climate. This plays right into why I wrote the article I did taking down Francis and Vavrus about “arctic amplification” causing these events. Those two ( Francis and Vavrus ) argued a warming arctic increases severe weather by their incorrect interpretation and use of Rossby wave physics. Tornadoes are caused when a cold front runs into warm, moist air. The more moisture in the air, the stronger the storm. Oklahoma and Texas are sitting where the moist air from the Gulf of Mexico, and cold fronts, from the north, meet, which is why they call it Tornado Alley. That of course is the setup for a tornado outbreak, but in some years the energy and location of the jet stream is not favorable for that moisture pump into cold air masses. Why? Because a buuterfly flapped its wings 6 months earlier in Brazil is as good an answer as any with our current state of knowledge on chaotic systems. This makes sense. I’ve been casually observing for years a seeming tendency for a specific meridional pattern, namely, repeat Inside Sliders and Tonopah Lows when then take an “exit stage left” turn down by Baja, to manifest as bad outbreaks on the Southern Great Plains. El Nino (even a dead one like this) shuts that down. And the claims you make are simply falsehoods spread by you. There isn’t more extreme weather. There isn’t more extreme flooding. There isn’t more extreme anything except statements from people who believe a warm rock fanned by frigid air got hotter because of it. ”Perhaps frustrated by the climate’s unwillingness to follow the global-warming script, the hard-core advocates for costly, energy-killing programs now point to every weather event as the wages of carbon-emitting sins. However, the numbers tell a different story: Upward trends for extreme weather events just aren’t there. Myth #1: Hurricanes are becoming more frequent. Myth #3: Droughts are becoming more frequent and more severe. that there is not enough evidence at present to suggest more than low confidence in a global-scale observed trend in drought or dryness (lack of rainfall) since the middle of the 20th century, owing to lack of direct observations, (in other words in spite of many many more people and fantastic sensing/signaling means, there aren’t any) geographical inconsistencies in the trends, and dependencies of inferred trends on the index choice. Myth #4: Floods are becoming more frequent and severe. Back at the article, ” For the U.S., the story is the same. Some places will always be drier and some wetter in comparison to an earlier period. there has been no trend. (represented by bars with negative values). From 1930 to 1941, the PHDI was consistently negative and set annual records that have not been matched. (4) No major hurricane made landfall in US since 1995. Only fools would argue that the climate in 2015 is bad, and has been getting worse. Fools … and leftists with ulterior motives for scaring people.